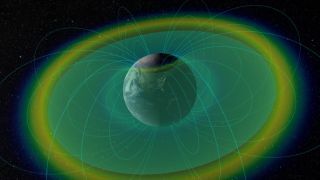 This image shows how particles move through Earth’s radiation belts. A cloud of colder material known as the plasmasphere sits in the middle of the donut-shaped belts and acts as a barrier to keep fast-moving electrons away from Earth. The pair of radiation belts surrounding Earth stop high-energy particles in their tracks, a new study reveals. Data gathered by NASA’s twin Van Allen Probes, which launched in August 2012, show that the donut-shaped Van Allen belts present a nearly impenetrable barrier to high-energy electrons, keeping them from hitting Earth. First discovered at the dawn of the space age, the Van Allen belts are two collections of charged particles that circle Earth, held in place by the planet’s magnetic field. Charged particles streaming from the sun cause the belts to grow and shrink, sometimes merging and occasionally forming three belts instead of two. On average, the inner belt reaches from 400 to 6,000 miles (640 to 9,700 kilometers) above Earth’s surface, while the outer belt spans 8,400 to 36,000 miles (13,500 to 58,000 km) above the planet. The new information gathered by the Van Allen Probes reveals that the inner edge of the outer belt is very sharply defined. Under normal circumstances, the fastest, highest-energy electrons cannot cross over the boundary, researchers said. "When you look at really energetic electrons, they can only come to within a certain distance from Earth," said study co-author and Van Allen Probes mission deputy scientist Shri Kanekal, of NASA’s Goddard Space Flight Center in Greenbelt, Maryland. "This is completely new. We certainly didn’t expect that." The plasmasphere, shown here in purple, is a cloud of cold, charged particles that interacts with Earth’s radiation belts, shown in grey. The scientists searched for possible sources of the newfound wall. They ruled out human-generated transmissions and the shape of Earth’s magnetic field, determining that the most likely cause came from the interaction of the belts with other particles in space. Earth’s outer atmosphere contains a cloud of relatively cool, charged particles known as the plasmasphere. These particles extend from about 600 miles (1,000 km) above the planet's surface partway into the outer Van Allen belt. Particles from the outer boundary of the plasmasphere cause particles in the outer belt to scatter, ejecting them from the belt completely, researchers said. The scattering effect is weak, and by itself might not be enough to keep the fast-moving electrons at the boundary in place if they were traveling directly toward Earth. However, the charged particles of the Van Allen belts travel at high speeds in a loop around the planet; their direction toward Earth comes as a slow, gentle drift over the course of months. Because their Earthward movement is so slow and weak, the plasmasphere is able to scatter the particles, keeping them away from the planet, researchers said. The weak scattering also explains why an unusually strong solar wind or powerful coronal mass ejection — a cloud of superheated, fast-moving plasma ejected by the sun — can overpower the barrier. "The scattering due to the plasmasphere is strong enough to create a wall at the inner edge of the outer Van Allen Belt," Baker said. "But a strong solar wind event causes the plasmasphere boundary to move inward." The research was published last month in the journal Nature.